No, that’s been Ford’s mantra for nearly 40 years now, but only because Ford sells all its pickups via a single brand, Ford, while General Motors sells its pickup as the Chevrolet Silverado and GMC Sierra. Combined, the GM pickups rule. 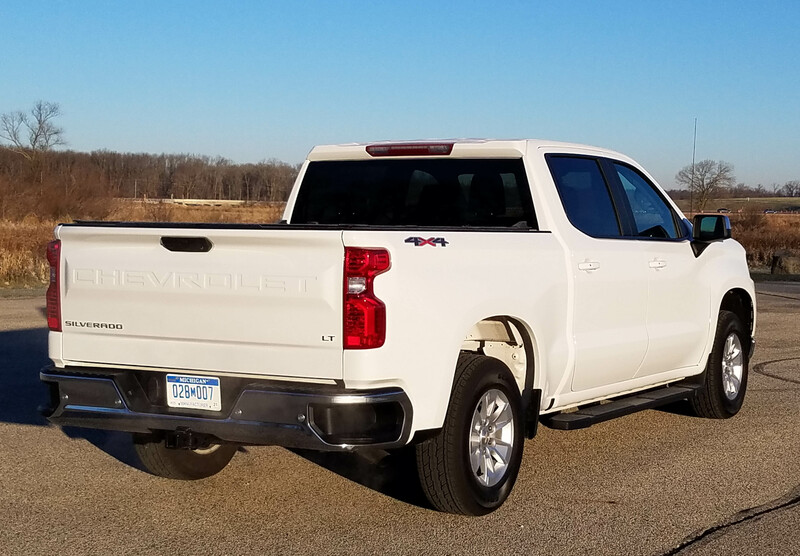 OK, it’s a fine point, but GM’s new pickup, mainly the Silverado ought to have Ford wondering whether even without the technicality of one brand vs. two it will maintain its pickup crown, or be dethroned. Silverado is all new for 2019 and it’s a dandy. It’s lighter (remember Ford went all-in on aluminum to cut weight a few years ago), more nimble (if a truck can be nimble), and still has the power and cargo pulling and hauling ability expected in a pickup. But mainly, it’s more civil, which is good because more and more folks use their extended cab pickup like a family car. Let’s start with the exterior. Chevy has smoothed Silverado nose’s styling to make it handsome, but mainly clean and attractive. This is still all pickup strength with appropriate bulges in the hood and a tall pickup bed wall. But I’m betting that female pickup drivers (soccer moms perhaps) are going to like this leaner, more athletic styling, and guys will too. Hey, we’re all toned and tan, in our own minds eye. The tested Summit White (bright white) pickup was the LT with 4-wheel-drive. The LT is just the third trim level up in an eight trim lineup. 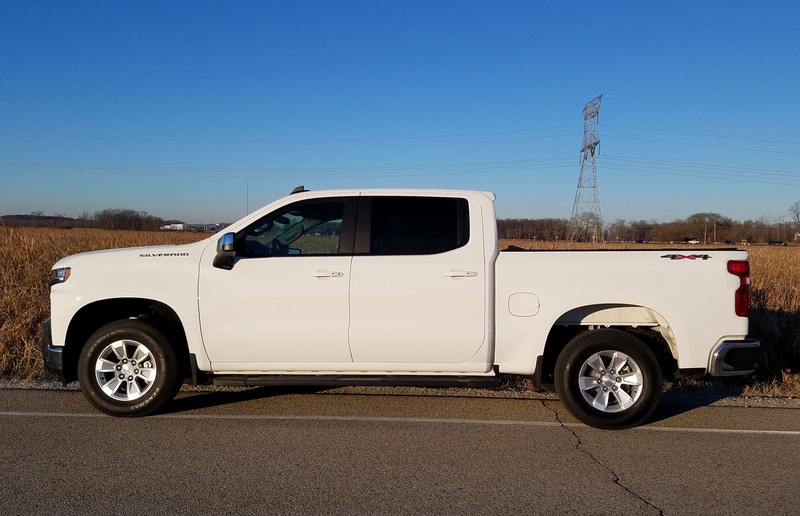 The base is the Work Truck model, next is Custom, then LT. For the record, that’s followed by RST, Custom Trail Boss, LTZ, LT Trail Boss and High Country. Simple, right? This one had the upgraded 5.3-liter Ecotec3 V8 with dynamic fuel management, a $1,395 option. It creates 355 horsepower, has a payload of 2,020 lbs., and will tow 6,700 lbs. The EPA rates it at 16 miles per gallon city and 22 mpg highway. I got 16.9 mpg in about 80% city driving. It drinks regular gas. Silverado feels lighter (it lost about 450 pounds as GM used more aluminum in its hood, roof, etc.) and the durable V8 delivers excellent low-end power to pull a trailer, or gallop away from a stoplight with authority. Chevy couples it with an 8-speed automatic that mostly does a great job, although occasionally it felt as if it were hunting for a gear in low-speed, low-gear acceleration. That mostly happened when first starting the truck in cold weather. 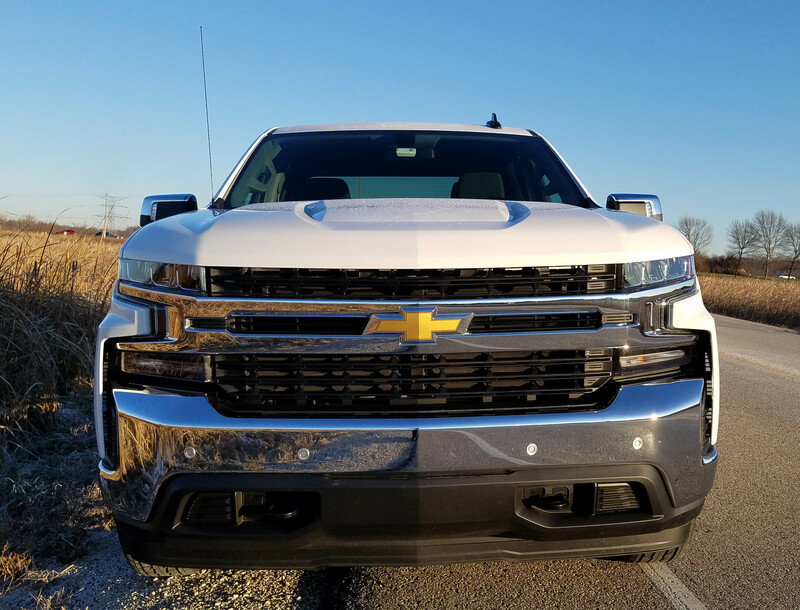 What surprised me most was the ease with which the Silverado handled and its smooth ride. Maneuvering the truck at low speeds and in parking lots was easy. It turns into parking spots well and didn’t feel as big as it is, and it IS big. This crew cab rides on a 147.4-inch wheelbase and is 231.7 inches long. Ride is good too, with only a moderate amount of pickup bounce on particularly rough roads and street imperfections. Braking is excellent too, important in a 4,915-lb. vehicle, especially if it’s fully loaded with dirt, wood, tools, or whatever. The truck also features Stabilitrak that helps limit trailer sway and gives the wheels more grip when starting on an incline. Then there’s the 4WD system that you can put into automatic mode via dash buttons to the left of the steering wheel. Or dial in 2WD, full-time 4WD or for off-roading, snow or mud. Inside the cab is roomy and easily seats five with oodles of rear seat legroom. I like the seats, which are just mildly contoured and heated too. 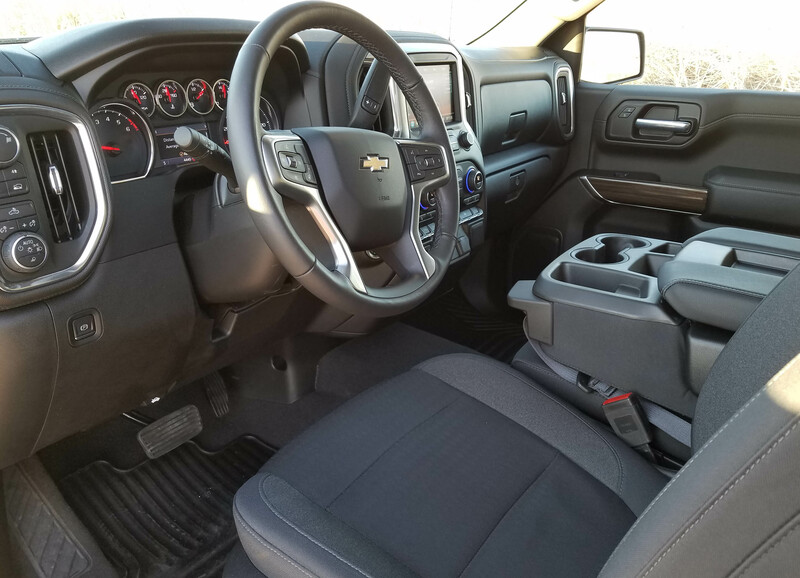 I’ve ridden a lot of miles in an older Silverado for my day job and these seats are much more comfortable. A couple rear seat passengers praised that back bench too. It also folds up to increase cab storage space. Up front is a giant armrest/storage box that when folded up would provide space for a sixth passenger. Its downside, when down, the driver feels confined and elbow room for short drivers is a bit tight. Also, the front passenger’s seat had no height adjustment so felt like it rode too low compared with the armrest and tall dash. The white test truck featured a gun metal gray cloth interior. I expected leather at the test truck’s price. But the cloth was comfortable and looked fine. The center stack’s face was flat black and there was gray gloss and satin chrome trim on the stack with satin chrome by the air vents. Fake gray wood trim dresses up the area by the door handles. A heated steering wheel added comfort to the pickup’s interior and there’s a manual tilt/telescope steering wheel with multiple buttons on the hub, including cruise control, although it’s not a smart cruise system. There’s a button inside to release the easy-lowering tailgate too, plus large easily adjusted climate control knobs. 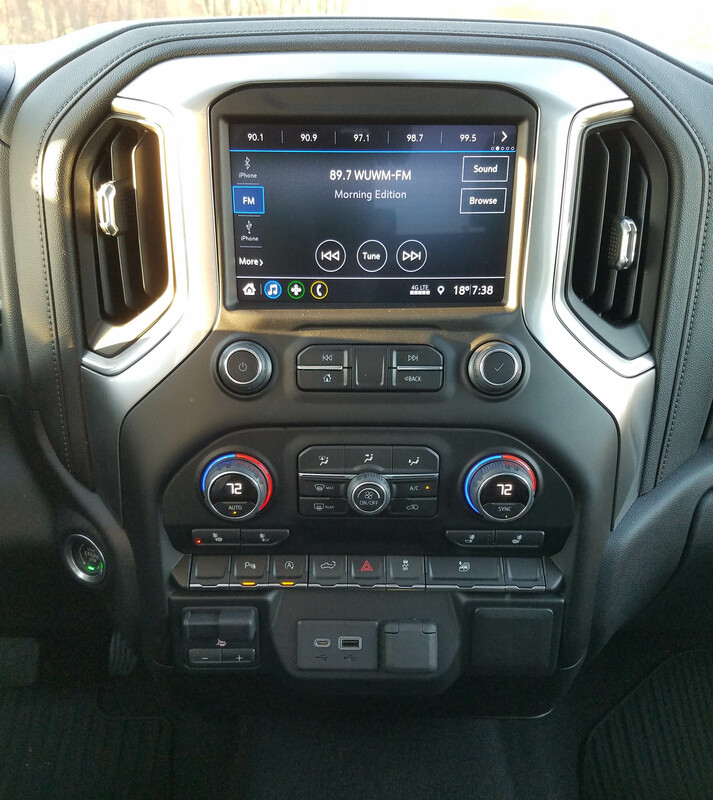 The touchscreen is simple to use for the radio, but the screen itself seems small for such a large vehicle’s dash. And oddly, there is no built-in navigation system. You’ll need to plug in your smart phone for that. Android Auto and Apple CarPlay are standard. Also standard is a rearview camera, and an OnStar system with SOS alert if you have an accident. An annoying warning chime also is standard, every time you shut off the engine it warns that there “may” be something in the back seat, so take a look. More useful are the features of an $890 safety package that includes front and rear parking sensors, lane-change alert and blind-spot warning. Running boards are standard too and help driver and passengers easily climb aboard the high-riding truck. 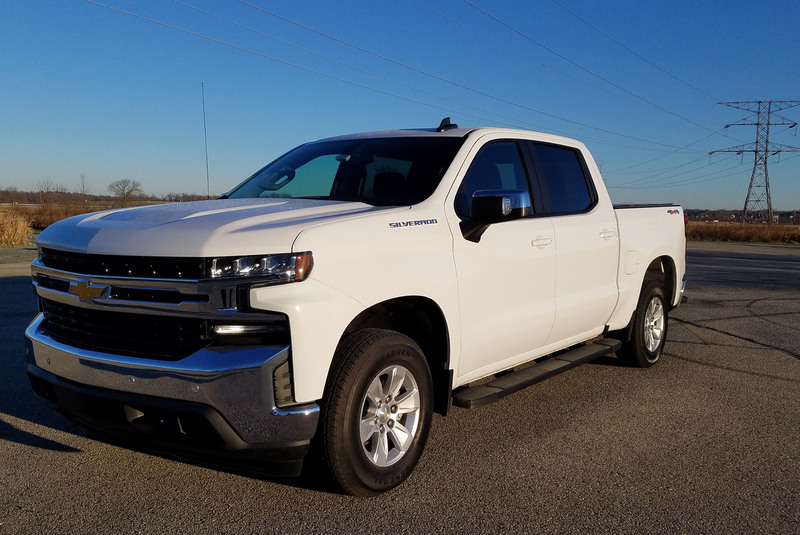 The test truck also included a tri-fold bed cover that protects cargo in the bed, which by the way is 7 inches wider inside than past Silverado beds. However, the bed is all steel. (Take that Ford!). That cover, plus some rear bumper assist steps, are part of a $1,750 option package. Gone are the days of the inexpensive pickup. Trucks are now where most automakers garner the majority of their profits. So the base price here, including delivery, shouldn’t surprise at $44,095. Add in all the options and the test truck hit $50,720. That includes a $500 discount on the All Star Edition package, bringing it to $2,315. That package includes a lot though, including a dual-zone climate control system, 10-way power driver’s seat, heated front seats and heated leather steering wheel, back seat USB ports, a rear window defogger, and rear auxiliary power outlet. It also includes keyless entry and remote start, a great feature for winter, and an antitheft system, tailgate with lift assist, LED bed lighting, a trailer package, the 40/20/40 split front bench seat, and an automatic-locking rear differential. 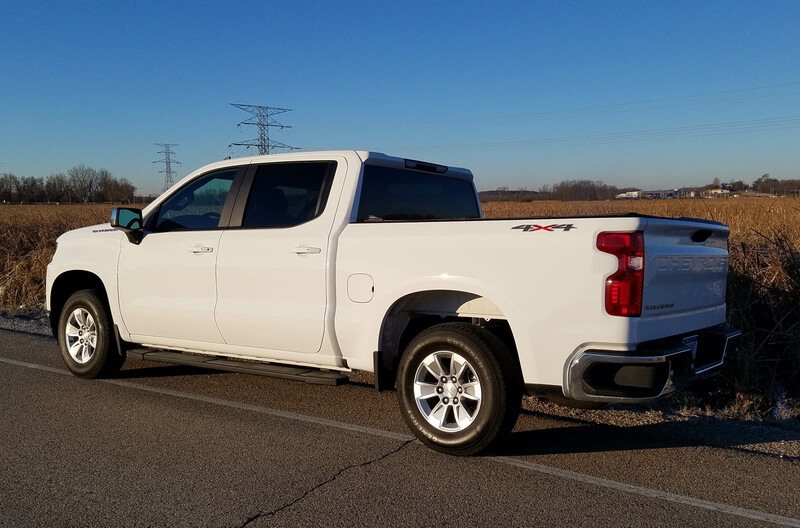 The base 2-wheel-drive Work Truck model begins at $39,395 with a 285-horsepower 4.3-liter V6. Moving up to a 2WD LT with the standard 2.7-liter turbocharged I4 with 310 horsepower moves the entry price to $40,791. As mentioned earlier, there are eight trim levels and six engines (including a diesel), all the way up to a 6.2-liter V8 that makes 420 horsepower and touts 460 ft.-lbs. of torque along with a 10-speed automatic transmission. The test truck was a short-bed model with a 5 ¾-foot bed, a long-bed at 6 ½-feet also is available. So you see options seem limitless. Choose a pickup that’s a simple family and grocery getter, or a full-on trailer-pulling beast. Chevy’s new Silverado looks well positioned to try and snag that No. 1-selling vehicle crown, even without help from its GMC cousin. If that even looks like it might happen, watch for Ford to start discounting F-150s, and quick. Hits: Good looking truck, roomy cab seats five, solid power, ride, handling and 4WD. Comfy mildly contoured and heated front seats, heated steering wheel and a running board helps in mounting. Covered bed, OnStar/SOS system, power release tailgate, easy climate control knobs and simple touchscreen. Giant armrest/storage box in front seat. Misses: Small touchscreen, giant armrest/storage box in front seat, no navigation system, annoying alarm sounds after engine is off to warn that something “might” be in the back seat.